I was so disappointed when I realized that I’d missed a day blogging, let alone 2 days. I have been sick with strep throat and just haven’t done much of anything. Now that I’ve been taking my antibiotics a couple days, I’m feeling much better. Today’s project is an Easel Card. 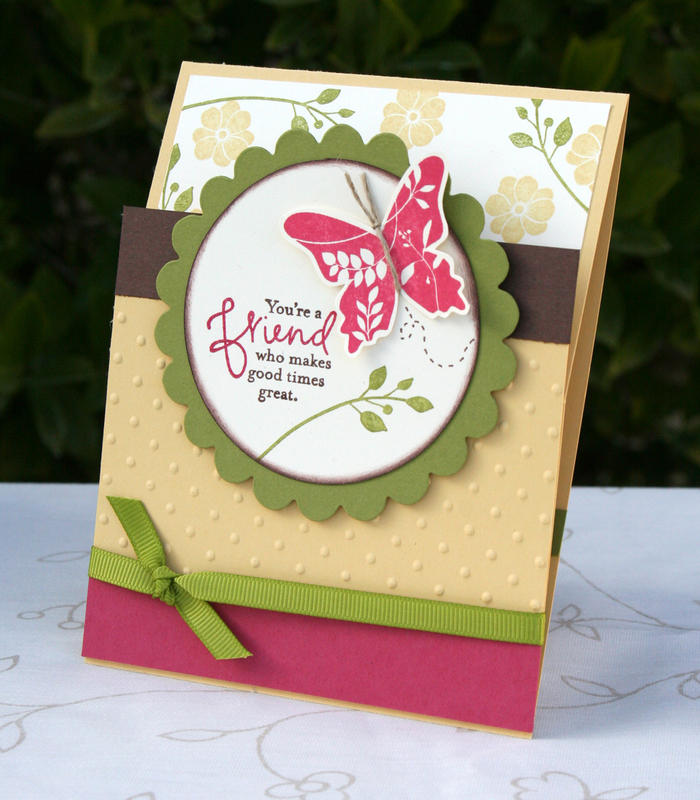 The easel card is a great way to show a friend how special they are. It displays nicely on a table or shelf for the recipient to view for as long as they want. Start with a piece of saffron cardstock that is 4 1/4 x 11, score it at 2 3/4 and 5 1/2. Use the big shot and the perfect polka dots embossing folder to emboss the 4 1/4 x 4 inch piece of saffron. Fold the card in half at 5 1/2, make sure that the side that has been scored at 2 3/4 is facing up. Crease the score line so it makes it easier to fold up once the 4 1/4 x 4 inch piece of saffron is attached. 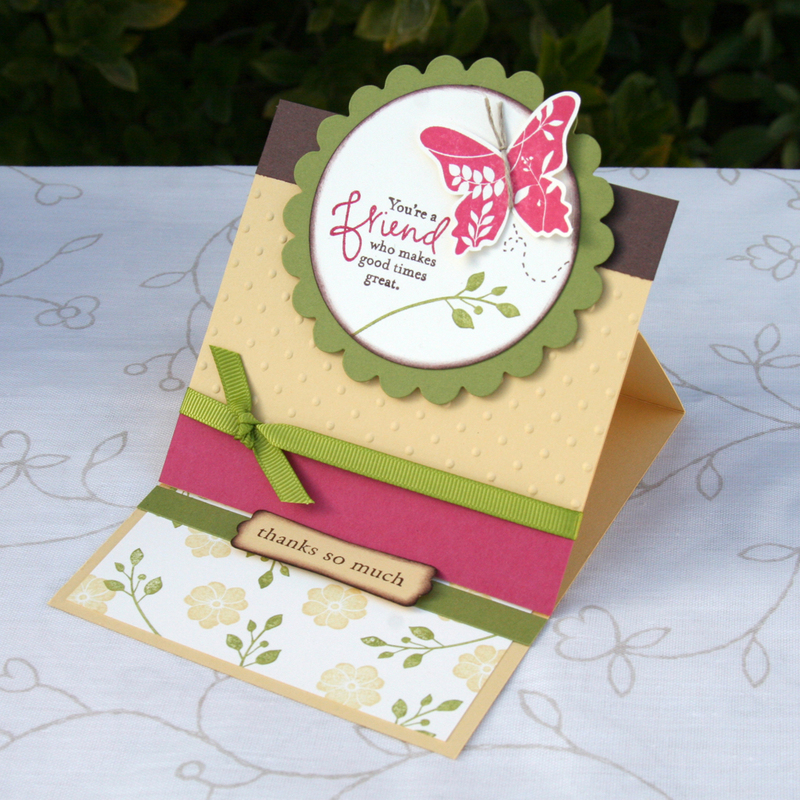 Apply adhesive to the lower portion of the card front and attach the embossed saffron piece to the bottom of the card. Now the easel base is complete. When you are ready to attach the focal piece, only put dimensionals on the lower 3/4 of the scallop. If you put adhesive in the upper area it will stick to the top of the card and will no longer be able to go into the easel position. The easel needs something to help it stay up, so on the inside of the card a dimensional was used to lift the greeting. This will act as a “stand” for the easel. Decorate the rest of the card as desired. I love easel cards! We did them as a club project last summer….my gals loved them! thanks for sharing your ideas! This is a super card and could be used for SO many occasions. Glad you are feeling better, and Jessica – it is OK to take a couple of days off….you now have my permission. LOL…. Glad I found your blog! I love the style of your work and look forward to seeing future posts. I found you on Stampin Connections, so thanks for sharing! Love this card I have yet to make one hope your feeling better!! !